STRATHFIELDSAY ensured Kris Lea’s 100th game for the club on Saturday was a memorable one with a massive 107-point belting of top five club Kangaroo Flat. On the wide open spaces of Flight Centre Park elusive forward Stephen Milne booted 8.8 (including two posters) for the Storm while ruckman Michael Pilcher bobbed up with four majors. Only Matt Giri was able to get the scoreboard ticking over early for the Roos with his three opening term goals before the Storm eventually romped home: 20.27 (147) to 6.4 (40). The Flat was hit hard by injury. Defender Liam Collins came off early and was later transported to hospital with broken bones in a wrist while forward Braydan Knox limped off in the first few minutes with an ankle injury. The Flat was super competitive in the opening term. They trailed by just eight points at the first change although Storm’s inaccuracy kept them in the contest. Giri’s straight-as-an-arrow set shots from centre half-forward at the Tannery Lane end were right out of the text book. At the other end Strathfieldsaye sprayed shots and the home side only just sneaked to the lead when Lachlan Sharp (off his non-preferred right boot) and Pilcher hammered home shots. The Storm defence led by Jayden Donaldson and running half-back Tom Dowd shut down the Roos in the second term. While keeping the visitors scoreless Strath added 4.7 as they had their turn with the breeze. After a string of minor scores Nathan Moffat and Milne, courtesy of a 50m penalty against Billy White, nailed shots. When Lachlan Bonney marked a Steven Baker pass and goaled after the half-time siren Storm was away to a 39-point lead. Inaccuracy was still Strathfieldsaye’s bugbear in the third term. Although winger Sean Johns, midfielder Jake Hall and Dowd kept pumping the forward a return of 6.8 was wasteful. Pilcher was unbeatable in the air and he added two majors from strong marks. The Roos barely passed half-forward and managed a measly two behinds. The Storm’s second turn with the wind in the final term yielded another six majors – three from Milne’s boot – as finally the Flat found the target at the Sheepwash Creek end with goals to Rinaldi and co-captain Luke Lougoon. Storm coach Darryl Wilson said defender Ash Trollop would be a scratching from the inter-league squad with a groin strain. “I thought the Flat boys turned the ball over a little bit, making us look better than we actually were. “But to win like we did was exciting considering we’ve still got a few injuries and a few other guys not 100 per cent. We go into a bye now with just the one loss against the best side (Sandhurst) so far. “And there’s Tom Bartholomew, Vinnie Flood, Shaun Everington and Sam Mildren still to come in,” Wilson said. 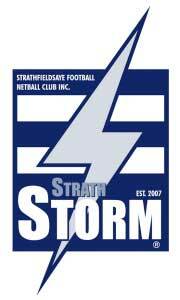 Goals – Storm: Stephen Milne 8, Michael Pilcher 4, Lachlan Sharp 3, Shannon Geary, Sean Johns, Nathan Moffat, Lachlan Bonney, Matt Smith. Kangaroo Flat: Matt Giri 3, Cameron Rinaldi 2, Luke Lougoon. Best: Michael Pilcher (best afield), Stephen Milne, Sean Johns, Jake Hall, Thomas Dowd, Jayden Donaldson, Jake Dickens. Kangaroo Flat: James Saville, Simon Davies, Matt Giri, Caleb Argus, Nick Lang. ALTHOUGH the third versus fourth clash at Flight Centre Park was a fizzer, the Princes Park battle between ninth-placed South Bendigo and cellar dweller Maryborough was the closest of the seventh round. With both clubs winless going into the game, South did slightly more when it counted to win by 20 points. Josh Whelan continued his stellar form with his second five-goal haul in two rounds for the Bloods as they saluted, 14.19 (103) to the Princes Park Pies 12.11 (83). Matt Bond booted five majors for Maryborough. The clash of the BFNL’s two unbeaten clubs in Sandhurst (1st) and Gisborne (2nd) was another fizzer. The Dragons cantered home by 73 points: 19.20 (134) to the Dogs 9.7 (61). Ryan Haythorpe and Mitchell Dole both finished with five-goal bags for the Dragons. At the Kyneton Showgrounds the reborn and re-vitalised Tigers (7th) notched their third won for 2014. Kyneton downed Castlemaine (8th) by six goals: 19.15 (129) to the Maine’s 14.9 (93). Exciting midfielder-forward Ben Weightman nailed six goals for the Tigers. Kyneton suffered a clearance blow early in the week. Tough and tenacious midfielder Hayden Wright requested a clearance back to his home club, White Hills, in the Heathcote and District Football League. Kyneton coach Mark Adamson said he and his club had no objection to Wright’s application. This was backed up by White Hills coach Shaun Makepeace who said there was “no animosity between Hayden and Kyneton. He just has a lot of good mates at White Hills and he was just keen to come back to play with them,” Makepeace added. Wright was the Demons’ best and fairest winner last year and on Saturday – after six games for Kyneton in 2014 – helped the Hillies trounce Heathcote: 21.14 (140) to 4.10 (34).